I once said that what Tamako Market lacked was romance, and that it didn’t make good on its potential by bringing real change to its characters’ lives. Now, with Tamako Love Story, they’ve done that. So the question becomes—did they succeed? Continue Reading "Tamako Love Story"
Finally, after 10 whole episodes, we have the one thing we’ve never seen before – a Tamako episode! With the “Tamako-sama” bomb dropped, all eyes are on her, and she doesn’t seem entirely comfortable with the attention. Continue Reading "Tamako Market – 11"
“How pathetic! What a worthless worry!” Right you are, Dera. Continue Reading "Tamako Market – 10"
It’s time for tsundere dad to take center stage. Continue Reading "Tamako Market – 09"
Comedy is a subjective thing, but I think it’s safe to say this was one of, and probably the funniest episode of Tamako Market so far. As long as you don’t hate Dera. Let’s discuss why. Continue Reading "Tamako Market – 08"
At first it was just happy tsuntsun fun with Choi-chan, when suddenly her story with her prince is colliding with that of Sayuri and Afro-kun. And Tamako is–!? Continue Reading "Tamako Market – 07"
Kanna confirmed for best girl. No objections. Continue Reading "Tamako Market – 06"
Did Tamako Market just turn into a romcom? The subtext around Midori, Tamako, and Mochizou gets louder as Midori and Mochizou go head-to-head in a thinly veiled competition for Tamako’s affection. Come on you two, you’re not fooling anybody! Continue Reading "Tamako Market – 05"
Continue Reading "Tamako Market – 04"
Ahhh, to be young and bashful again. This was only partially a Shiori episode though, as Dera once again went about stealing the show. Continue Reading "Tamako Market – 03"
Valentine’s Day comes to the shopping district, bringing with it love, celebration, and sage words from a gentlemanly bird to a confused young maiden. Already this show is going in another direction I did not expect, and I couldn’t be happier. 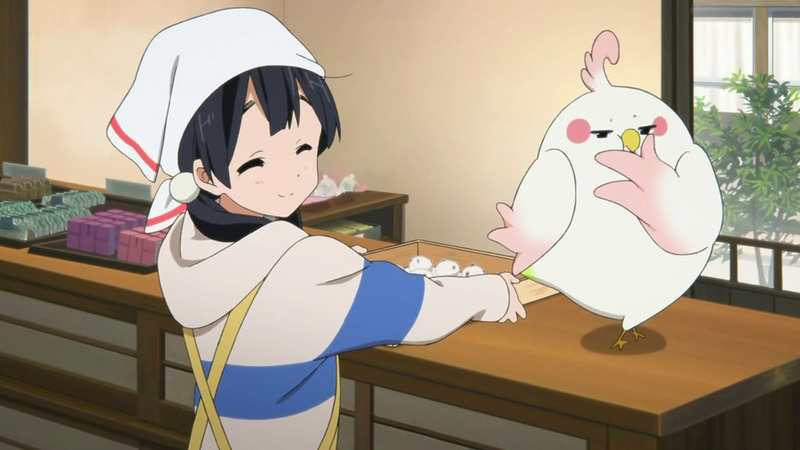 Continue Reading "Tamako Market – 02"
Okay, this is cute, pretty KyoAni alrigh–woah did that bird just WHAT!? Welcome to Tamako Market, where no one knows what’ll happen next. Continue Reading "Tamako Market – 01"